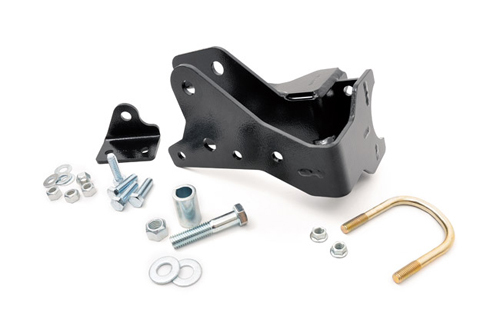 After lifting a Jeep JK, the track bar bracket helps restore proper geometry of certain suspension components; accommodating the difference in height by essentially relocating where the track bar connects to the track bar mounting point on the axle. However, Rough Country’s new Track Bar Relocation Bracing Bracket takes this idea one step further, utilizing a uniquely designed bracket that braces the mounting point by connecting to the axle tube and is fortified by a heavy duty U-bolt. This design offers unparalleled protection for off-road applications by circumventing the track bar mounting point on the axle - a common weak spot on stock equipment - as well as increases the lifespan of these sensitive suspension parts.